After being decked in Holland after 8km I was loathed to race and took my time watching to see where gliders were doing well and badly. 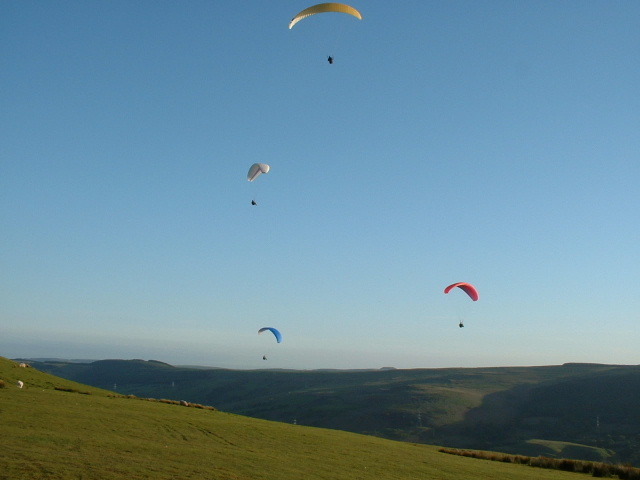 I flew across the Blorenge and joined a small gaggle of four gliders and a paraglider however I just couldnt seem to top out with the flex wings, perhaps it was me not being used to gaggles, still 20km out only 88km to go, gulp!. The view was excellent the grimy, industrial landscape of the welsh valleys changed to the rolling hills of the English border, in the distance the Malvern Hills could be seen beckoning. After crossing left of Abergavenny at 35km out I was in trouble and only had the paraglider with me, the wind was now southerly and it was obvious that the sea breeze from the Bristol Channel was pushing in destroying lift. This is where I made my BIG mistake. To the left there was more sun and the clouds were still good whilst on track the sky was becoming more overcast but I could see one or two gliders ahead, albeit low. I decided to follow them and use them to mark the lift. 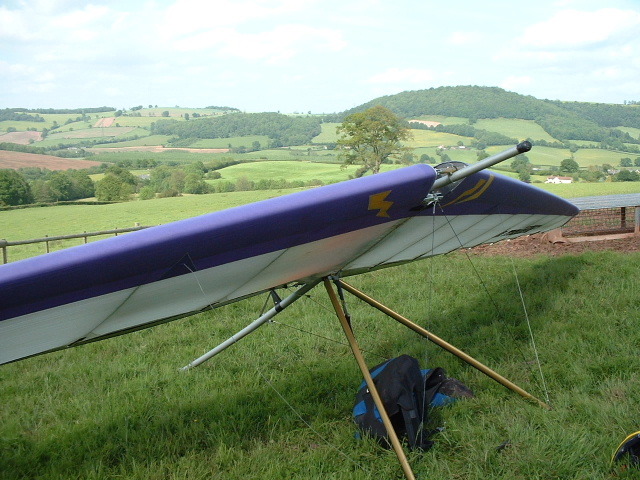 The lift was weak and broken and I lost more height than I gained and eventually landed near Monmouth, some 42km from Merthyr. I met the paraglider pilot the next day who landed out after 35km and he said he was willing me to go off track to see if the lift was better there. I heard later that pilots who took this (better) line flew at least 80-90km. John Vernon managed a credible 39km getting decked in the same area as I did in the sea breeze zone. Tony flew a great day, he caught up with the lead gaggle and made it to goal as the only rigid pilot together with Andy Hollidge and a few others including Gordon Rigg. John Vernon and myself had to get back to Merthyr before dark, with no retrieve driver arranged this was a real pain. John got a lift to Crickhowell picked my car up, then picked me up from where we drove to Merthyr. Up and down the nightmare track two times, we had to leave Andys car in a nearby village with the hope that it wouldnt be broken into overnight. Lesson No. 2 dont go to a comp without a retrieve organized. Tony and Andy only had to walk from the goal field to Johns house 500m away the lucky bastards!.